There’s no doubt about it, I love animals; among them are dachshunds, kittens, horses, deer, monkeys, meerkats, birds, fish, frogs, and slow lories, but above all else—ferrets…. 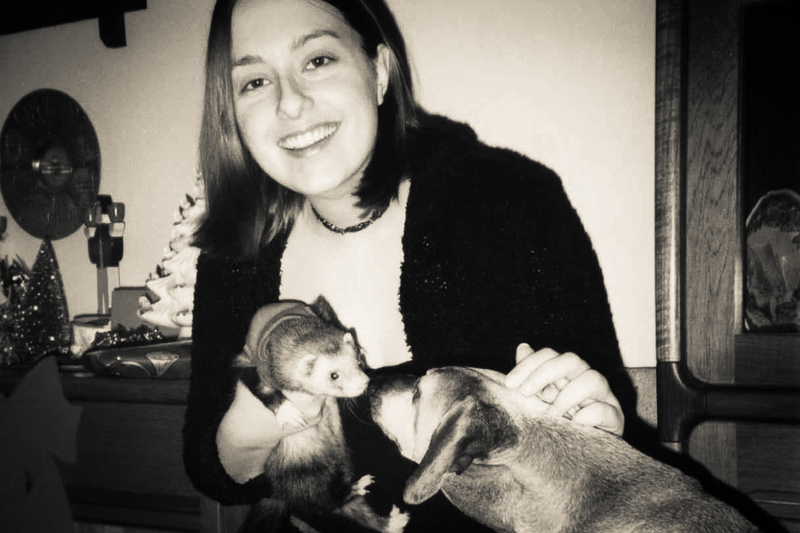 I became a ferret owner by chance sometime around 2001. My dog of 13 years had passed away, and I felt very lonely. A friend of mine knew someone needing a home for a critter I had never seen before, so I agreed to take on a new pet. In part, it was to help me grieve, but more importantly, to show the little guy love. Maxifer Jones was my first introduction to “ferretude.” He was definitely a rascally ferret with an attitude. He loved to get into mischief so much that I wrote him a poem (see below). He would steal shiny things out of my friends’ coat pockets, along with packs of gum, cigarettes, and anything else he could get his claws on. He was a great introduction to this animal breed so new to me. Max passed after four or five years of a mysterious viral infection, and it took me an entire summer to get the nerve to commit to getting my heart broken again by such furry little angels. This time, I dove head-first into adopting two ferrets from the Ferret Rescue & Halfway House in Martinsville, near Bloomington, Indiana, from a nice lady named Mason Lowrey, who keeps about 80 ferrets at any one time in a barn. It was December of 2006 when I signed a waiver swearing I’d take the best of care of these two ferrets just under two years old. Welcoming my two new family members involved a daylong drive from Chicago, where I was living at the time, to Indiana and back. But alas, the ferrets were my Christmas wish. I had originally wished for one, but I was blessed with two. And after I found the two “snuggling too close” one night, I realized I hadn’t been given two boys; it was a boy and a girl! I was so surprised! So, I named them Olivia Benson and Elliott, after the characters in my favorite television show at the time, Law and Order: SVU. Elliott and Olivia loved to wrestle each other in a playpen box of rice, chase each other through tunnels, play rough, cuddle up close, climb up and out of everything, and show lots of love. Elliott was known for stealing lighters and hiding them under my bed. He also loved to play tug-of-war with stinky socks, while Olivia would bat her pretty eyelashes at me, slump into a funny “pear shape” whenever I’d hold her up, give me kisses on my face, jump and climb out of play pens, just like Elliott. She would grow into a much skinner motherly type in her old age, living just past seven years old, caring for her ferret mates by cleaning their ears and toes. She cheated death at least three times—even after accidentally getting stepped on, losing all her hair, having anemic outbreaks and low white blood cell counts, and getting a tumor removed. By this time, Olivia was turning grey, and she wasn’t as energetic as she had once been. An onset of adrenal gland disease and breast cancer didn’t slow her down though. She fought hard and lived another three years, taking care of little Percy as he grew (even larger, if that was possible). He kept her warm in their cuddle cup, often covering her as a makeshift blanket with his entire body. Olivia is nearing the end of her days now. Bless her heart. Now Percy is almost three years old, and he is rambunctious as ever, aiming to climb up as high as he can go, biting buttons off shirts for laughs, and stealing all stuffed animals near his territory and putting them in their place—the farthest back corner in sight! I love ferrets, and it is more than evident that ferrets love me back—unconditionally. If you are able to make a responsible commitment to giving a ferret a comfy “forever home” and lots of tender love and care, visit the Ferret Rescue & Halfway House. There is a smaller shelter on the Southside of Indianapolis, Indiana, that also adopts out ferrets: Five Points Ferret Refuge.